Recreational boat owners who install a FloScan Fuel Monitoring System report that it quickly becomes the most important instrument aboard and the one they depend upon more than any other. A fuel monitoring system tells them so much about their boat's operation that they wouldn't otherwise know. Best of all, it keeps them totally informed about their fuel situation from minute to minute. It's little wonder that boat owners feel that a FloScan Fuel Monitoring System should be standard equipment on every vessel. Models are available for virutally all gas and diesel engines rated from 25 hp to 4000 hp. Our Series 7500/7600 Multifunction Meter combines a digital LCD Engine Hour Meter, Tachometer, Fuel Flowmeter, and Fuel Totalizer in a single 3-3/8" diameter instrument which fits the panel space of a standard tach. A popular option is to replace the existing tach(s) with this system thus eliminating the need to cut new holes in the panel. A Series 8500/8600 Fuel Flow Interface System combines a digital LCD Engine Hour Meter, Tachometer, Fuel Flowmeter, and Fuel Totalizer in a single 3-3/8" diameter instrument which fits the panel space of a standard tachometer. This meter also provides a fuel flow rate output signal for GPS systems, data acquisition systems, and for FloScan Series 9700/9800 GPS Interface systems in twin diesel engine boats. A Series 85000/86000 Fuel Flow Interface System combines a digital LCD Engine Hour Meter, Tachometer, Fuel Flowmeter, and Fuel Totalizer in a single 3-3/8" diameter instrument which fits the panel space of a standard tachometer. This meter also provides a fuel flow rate output signal for GPS systems, data acquisition systems, and for FloScan Series 97000/98000 GPS Interface systems in twin diesel engine boats. Our Series 9500/9600 GPS Interface System combines a digital LCD Engine Hour Meter, Tachometer, Fuel Flowmeter, Fuel Totalizer and nautical Miles Per Gallon over the ground in a single 3-3/8" diameter instrument which fits the panel space of a standard tachometer. The speed signal required to calculate the nMPG reading is obtained from GPS and Loran systems having a NMEA 0183 serial port output. The direct display of nautical Miles Per Gallon over the ground gives the skipper a powerful new tool to set optimum fuel efficiency under all conditions and to determine precisely how far he can go with his remaining fuel. Our Series 9700/9800 GPS Interface System combines a digital LCD Engine Hour Meter, Tachometer, Fuel Flowmeter, Fuel Totalizer and nautical Miles Per Gallon over the ground in a single 3-3/8" diameter instrument which fits the panel space of a standard tachometer. The speed signal required to calculate the nMPG reading is obtained from GPS and Loran systems having a NMEA 0183 serial port output. A Series 75000/76000 Multifunction Fuel Monitoring System combines a digital LCD Engine Hour Meter, Tachometer, Fuel Flowmeter, and Fuel Totalizer in a single 86mm diameter instrument which fits the panel space of a standard tachometer. Perfect for determining the most efficient engine speed and the exact amount of fuel in your tanks. Models are available for virtually all diesel engines from 25 hp to 6000 hp. 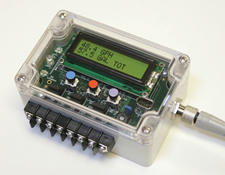 Our GPS Interface System combines a digital LCD Engine Hour Meter, Tachometer, Fuel Flowmeter, Fuel Totalizer and Liters per Nautical Mile over the ground in a single 86mm diameter instrument which fits the panel space of a standard tachometer. The speed signal required to calculate the l/nm reading is obtained from GPS and Loran systems having a NMEA 0183 serial port output. The direct display of Liters per Nautical Mile over the ground gives the skipper a powerful new tool to set optimum fuel efficiency under all conditions and to determine precisely how far he can go with his remaining fuel. Our Series 97000/98000 GPS Interface System combines a digital LCD Engine Hour Meter, Tachometer, Fuel Flowmeter, Fuel Totalizer and Liters per Nautical Mile over the ground in a single 86mm diameter instrument which fits the panel space of a standard tachometer. The speed signal required to calculate the l/nm reading is obtained from GPS and Loran systems having a NMEA 0183 serial port output. The FloNET® Diesel Series is designed to interface with a NMEA 2000 network. The FloNET Interface hub takes current fuel rate values and broadcasts it to the network via PGN 65280 (FloScan Fuel Rate) and PGN 65281 (FloScan Fuel Total). The data is also broadcast simultaneously under PGN 127489 (Engine Parameters Dynamic) and PGN 127497 (Engine Trip Parameters). NOTE: Please refer to your manufacturer's product manual to confirm fuel flow display options. FloScan Reduces Fuel Consumption and Lessens Environmental Impact. Fuel costs are the single largest recurring expense involved in operating a commercial vessel and FloScan is dedicated to providing advanced Fuel Flow Computers that maximize vessel fuel efficiency.